Epic Games will present an educational component for OP Live Dallas. The premier esports event runs Sept. 22-23, 2018 at the Irving Convention Center in Irving, Texas. eGency Global, a leading esports production, marketing and talent management firm in collaboration with SMU (Southern Methodist University) Guildhall, the top ranked graduate school for video game design in the world, are pleased to announce the Bounty Royale Brawl featuring Fortnite, Inc. will be held during OP Live Dallas. Epic Games is a Cary, North Carolina-based video game and software developer responsible for developing the Unreal Engine, as well as Fortnite, one of the most popular video games in the world today. The company’s participation in OP Live Dallas will be featuring development education over their Unreal Engine. Epic’s relationship with the founders of OP Live goes back years. SMU Guildhall uses the Unreal Engine for teaching purposes and to build games, many of the school’s alumni launched their post-graduate careers at Epic and still work there today. 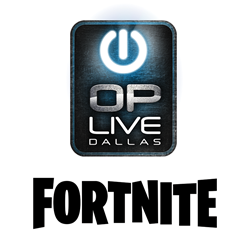 Due to the robust popularity of the Fortnite video game, it comes as no surprise that OP Live Dallas is delighted to feature the Bounty Royale Brawl in its line-up of activities this fall. “When we were looking at what events to have at OP Live, I asked students what would be the ideal esports game to have at our event. The answer was unanimous. Everyone said it had to be Fortnite. This mirrors the popularity of the game, as it’s really starting to blossom and grow in esports right now,” Nausha says. In addition to the Bounty Royale Brawl, esports fans, parents and video game industry influencers are in for a jam-packed weekend. The event will also feature esports competitions, the latest video games created by SMU Guildhall students and alumni, pro esports player meet and greets, interactive experiences, a High School Hackathon, education about esports, sponsorship opportunities, exhibitor hall and more. Funds raised by gamers during the event will benefit Extra Life™, an organization that supports local Children’s Miracle Network Hospitals®. To learn more about attending OP Live Dallas Powered by Team Envy and the Dallas Fuel, purchase tickets and get event updates, visit http://www.OPLiveDallas.com/. For information on sponsorship opportunities (digital, event app, brand activations, signage, event/activity/workshop sponsor, broadcasting rights, food truck zone and more) or securing exhibitor space, contact Ward Eastman, eGency Global Director, Strategic Alliances at 214-957-7870 or weastman(at)egencyglobal.com.